From the positive feedback I got from last week’s Midweek Market Analysis, I trust that you guys are all ready for another one this week. Might I add that it was probably one of the reasons why I was able to score a pretty decent win on my USD/CAD trade then! As I mentioned before, not only am I wishing that this could help me get in sync with the market’s behavior, I’m also hoping that my Comdoll Trading Kit could guide you in your comdoll trades as well. Over the weekend, the People’s Bank of China announced a 50 basis point cut on its reserve ratio requirement. This means that Chinese banks could hold less cash in their vaults, allowing them to approve more loans and boost liquidity in the country. This could pump up spending in China, which could translate to higher production and imports from commodity-exporting nations. Is the Greek bailout a done deal? The release of the Greek bailout funds is still a prevailing issue for this week as euro zone finance ministers agreed on the next tranche of aid yesterday. However, Greece still has several hurdles to clear and this includes negotiations with its private bond holders and debates among the national parliaments of the euro zone nations. It might take a while before the funds are actually signed, sealed, and delivered! Based on the minutes of the recent RBA monetary policy meeting, the central bank isn’t really considering cutting rates just yet. Policymakers don’t seem to be so troubled about the euro zone debt situation as they were before, and they also pointed out that the improvement in the U.S. economy could be positive for the global economy. Despite these relatively upbeat news, comdolls seemed to have trouble holding their ground for the first few days of this week. The weekend gaps were quickly filled as traders remained uneasy about taking on more risk, and this cautious sentiment weighed on the higher-yielding comdolls. For now, all three comdolls are in the red, with AUD down by nearly 1% against the U.S. dollar, NZD posting a 0.8% drop and CAD showing a 0.3% slide. That’s enough to erase most of their gains from last week! Do you think a midweek reversal could be in the cards though? But before you go on trading for the rest of the week, you should definitely have a look at what’s coming up for the comdolls in the calendar below. Fresh off the press was China’s manufacturing PMI, which came in slightly better than forecast at 49.7. Oh, and before I dash off to hunt for a new trade setup for this week, I’d just like to announce that BabyPips.com got three nominations in FXStreet.com’s Forex Awards for 2012. Yipee! Just to get nominated for three categories is a huge honor, but it’d be hella awesome to score a win too. Cast your votes right here. The link for the polls is at the top part of the page so you can’t miss it! Happy trading this week, folks! 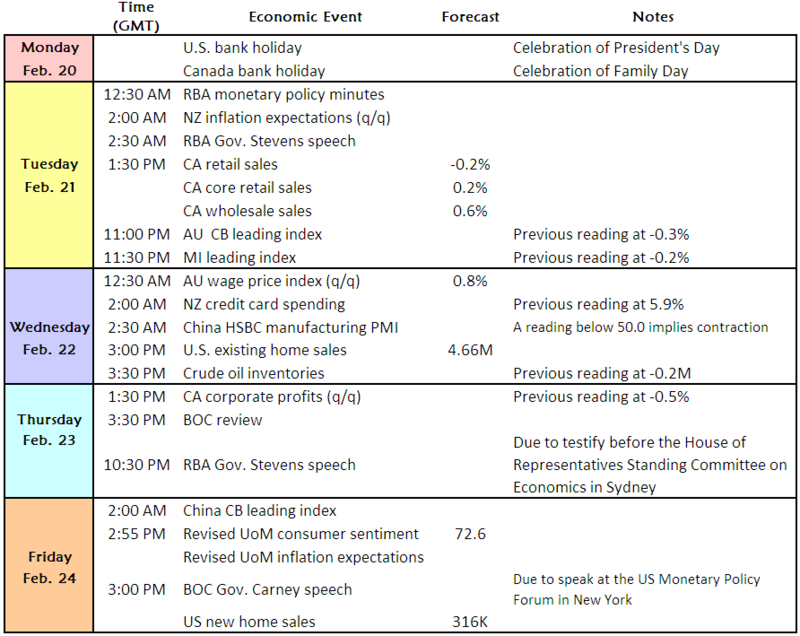 Looks like our calendar is pretty light this week with only China’s HSBC manufacturing PMI and Canada’s retail sales figures possibly making waves among comdolls. Still, the RBA will release its meeting minutes, while the U.S. will also print its new and existing home sales data. Whether you’re planning on using the STA strategy or just simply marking your charts for the week, you’ll definitely want to take a peek at these levels! Alright, that’s it for me today! If you want to ask or share anything, just tell me, okay? Thanks for giving your feedback! Happy trading to you all!